This review is written by Gary. 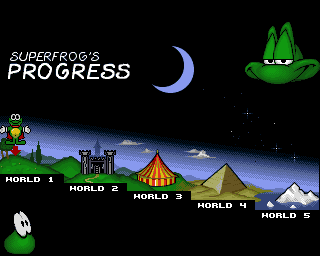 A game that will always have a special place in my heart is Superfrog. I came across this game when my parents bought me the ‘Amiga’ monthly magazine and it was on the demo disc. At the time in our house we had the Amiga 600 and the Sega Mega Drive, the latter I played a lot more, until I decided to test out my new free demo. I was instantly hooked! The demo featured World 2 Spooky Castle and it was incredibly entertaining, and after completing the demo many times my dad bought me the full version of the game. 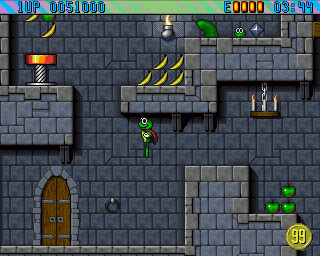 Superfrog is an adventure 2D platform game which was released in 1993. The premise of the game is basically a crazy comedic fairytale, you were once a prince, trying to save a princess from an evil witch. There are 6 fantastically colourful strange worlds divided into 24 levels. You run through each level collecting coins and killing your enemies by jumping on them. You can power up using bottles of lucozade (yes, orange luccy) and can use your Superfrog cape to glide down to further away platforms. There are lots of secret passages and hidden doors to guide you to more booty which adds to the fantastic gameplay. At the end of each level you are faced with a fruit machine which you can gamble your coins on for extra lives, or a level code meaning you can restart at a better place in the next level of you die. When faced with this gamble it is extremely hard to turn down! Each world was beautifully designed, you start in the Forest, then move on to the Castle, then the Circus, then ancient Egypt, followed by the Ice Caverns and finishing off at the Interstellar base. The game itself had great graphics for its time and was immensely entertaining with a catchy soundtrack that I can still remember after all these years. It was a shame that further sequels didn’t follow straight after the first cause I’m sure Team 17 could have built on the franchise. All in all this is a fantastic game which captures your imagination right from the beginning. There’s a certain degree of difficulty to each level which adds to the fun along with the ‘Project F’ level which I won’t spoil for you! It would definitely be a must buy for anyone interested in retro gaming, as it brings you back to the good old days of the 2D platform games. After going back through my collection of older games and gaming systems this game was definitely the best wee gem I unearthed. I find it a great game to play with young children due to the simplicity of the controls and the genuinely entertaining storyline. It was the first game that got me interested in the Amiga 600, one of my favourite all round computers, and after 22 years on, a game I will always remember as being one of my favourites.